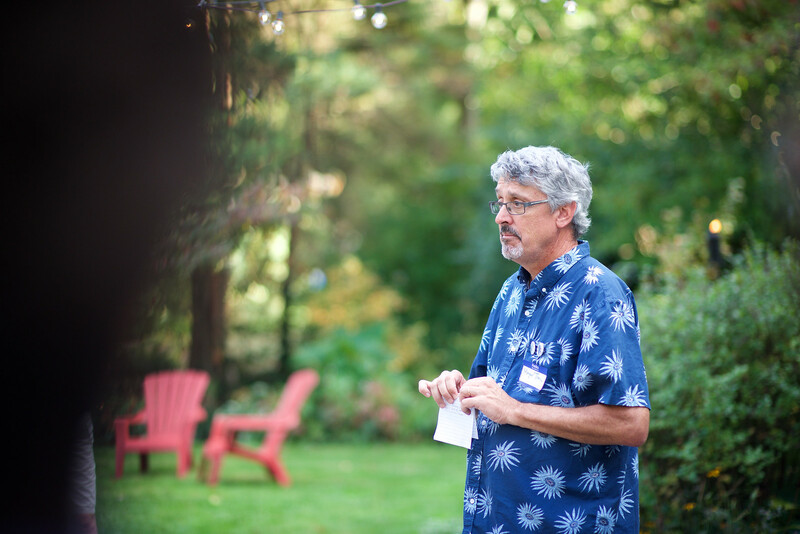 SWARTHMORE >> In a packed lobby of town hall, borough Mayor Tim Kearney, a Democrat, announced his intention to run for the seat held by state Sen. Tom McGarrigle, R-26, of Springfield. 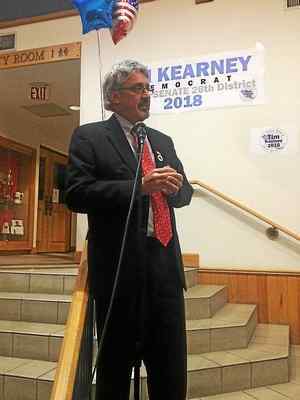 Kearney was re-elected to a second term as Swarthmore mayor this year and has served on the borough’s zoning hearing board and planning commission. A father of two adult children, he has lived in the borough for 23 years. He said both President Donald Trump’s election a year ago and this November’s sweep of Democrats into county positions propelled him to run. Kearney said it was his grandmother who said, “You’ve got to be willing to work for the kinds of things that you really want. McGarrigle offered his perspective on the mayor’s entrance to the race. State Rep. Leanne Krueger-Braneky, D-161, of Swarthmore, came to Kearney’s announcement. Kearney said the seat is winnable for Democrats and that there is a lot happening in Harrisburg. He identified the budget, education and the environment among his top concerns. To his supporters holding signs and eating blue and white “Tim Kearney 2018” cake pops, he said, “If you think clean water to drink and clean air to breathe are more important to us than for people to make profits in whatever their business is that does the polluting, then send me to Harrisburg. “If you believe that it’s outrageous that women don’t get paid equal amounts of money for equal amounts of work, if you think that women have the right to make their own health decisions about their own bodies as opposed to politicians, then send me to Harrisburg,” he continued. Kearney underscored his belief the Democrats can win this seat. The 26th state senatorial district includes Aldan, Clifton Heights, East Lansdowne, Glenolden, Marple, Media, Millbourne, Morton, Newtown, Prospect Park, Ridley Park, Ridley Township, Rutledge, Springfield, Swarthmore, Tinicum, Upper Darby and Upper Providence in Delaware County and a small part of Chester County. In other campaign news, today state Rep. Jamie Santora, R-163, of Upper Darby will kick off his re-election campaign by collecting toys for needy families at 11 a.m. at Anthony’s Restaurant in the Drexeline Shopping Center in Drexel Hill and at 12:30 p.m. at the Clifton Heights Fire House. Both events are open to the public, who are asked to bring new, unwrapped toys for younger children while enjoying hot chocolate and cookies with a Santa visit and Christmas carols to sing. And, he said he was making a deliberate choice to focus on what unites people.